We are excited to announce that we are headed back to the great state of Texas for Grunt Fest 7, The Texas Takeover! We will be at Cowboys Dancehall on April 7th, 2018! 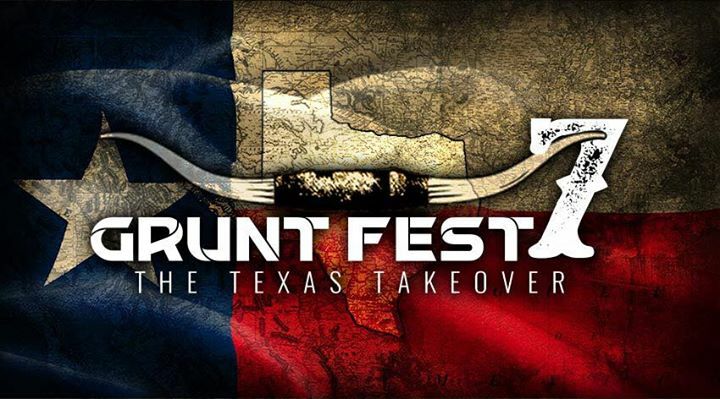 Grunt Fest 7, The Texas Takeover! Get ready for Kane Brown the headlining performer for Grunt Fest 7! We are also bringing back the infamous DJ Scandall to keep the party going! Stay tuned for more musical announcements! We invited all of Grunt Style's Brands out to join us in this madness and they followed through in a huge way! We don't want to give away all of the secrets we have in store for you, but here is a little taste. Club Grunt Style presents The Club Lounge. Grunt Style Motorsports presents Demo's by Nitro Circus. Grunt Style Pro and Merica Bourbon presents Smokey's Cigar Lounge. Grunt Style Golf presents the VR Long Drive Competition. Alpha Outpost present The Outpost. Grunt Style Outdoors presents The Shoot Out. Grunt Style Fitness and GruntFit present The Stairway to Heaven. The doors will open at 6pm at Cowboys Dancehall in San Antonio! At the door please have your tickets printed or on your phone for quick access. If you ordered a shirt, they will be handed out on April 7th at the event! There will be plenty of shirts for purchase as well. VIP: 150 dollars SOLD OUT! Grunt Style Premier Package: 250 dollars SOLD OUT! Fire Team Package: 200 dollars SOLD OUT! -Four tickets at a discounted group rate. We have a few more secrets in store for you, but the only way to find out what those are is to get some tickets and come join us for the party of a lifetime! If you love America, hate ISIS, and support our troops then this is the party for you! Come help us celebrate the incredible Freedoms we have as Americans!